Home » Posts » Statements » March 4 Education Protests Rock The Nation! March 4 Education Protests Rock The Nation! The March 4 national day of action for education was a huge success! Over 100,000 people marched, rallied and took action at over 100 schools and colleges. The biggest protests were in California, both on college campuses and in city streets. College students and union members joined parents with their children, as well as high school students, to demand education funding from the state government. Across the country, students, union workers and faculty marched across campuses and rallied outside administration buildings, while administrators hid or snuck out the back door. In some cases university chancellors and presidents locked themselves inside their offices surrounded by police while students tried to deliver petitions. The right-wing media is claiming that student protesters are self-serving and greedy. Nothing could be further from the truth. The students are fighting for what is right in an attempt to forge a better society. What the corporate media and rulers are truly afraid of is the possibility that the student movement will spark a broader movement during the economic crisis. The education rights movement is a challenge to the powers that be, because of the example it sets. And the powers that be respond accordingly – just look at the 16 arrests at the University of Wisconsin-Milwaukee. March 4 was a tremendous day for Students for a Democratic Society (SDS) both locally and nationally and more students should join SDS so the education rights movement can continue. It is important to organize protests both nationally and on the local level, uniting activists to make practical mass demands in the context of the biggest economic crisis since the Great Depression. At colleges, coalitions of union workers, graduate student and faculty unions and student organizations like MEChA and SDS can make an incredible difference. Students from kindergarten through high school, parent and community organizations alongside teachers’ unions are uniting to find common demands and stop privatization. These coalitions have and will bring out hundreds and thousands of protesters to march and place demands on school and college administrators, boards of education, state legislators and governors. There is also growing resistance to the federal government’s spending on war abroad and anti-union policies in education at home. The fight has just begun, there are more cuts coming. State budgets are in crisis and it is not going to get better anytime soon. University administrators wring their hands and point at politicians and governors. The politicians, funded with wealthy people’s money, give excuses and even justify themselves as carrying out the ‘people’s will.’ It just isn’t so. In our country, education is more and more about big business and profits and less and less about what is good for people or for a just, fair and healthy society. We have begun to build a mighty movement to defend public and free education. 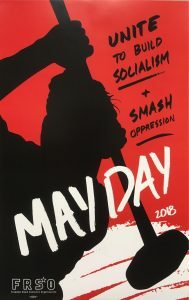 May Day 2008: Long Live the Peoples’ Struggle! No to the Escalation – End the Afghanistan War Now! Next post Education is Under Attack! Organize! Fight Back!